The Southern Division of the American Fisheries Society (SDAFS) had its origins at the Denver, CO meeting of AFS in September 1947. Members in attendance from the southern states felt that time limitations and the formality at national meetings inhibited adequate discussion of problems peculiar to our region. They agreed that a forum was needed where research findings, management applications and other common interests might be discussed in a more informal atmosphere. A decision was made to pursue such a forum. The organizers included Jack Chance (TN), Minor Clark (KY), John Dequine (FL), R. W. Eschmeyer (TVA), Nelson Gowanloch (LA), Joe Hogan (AR), Willis King (NC), Homer Swingle (AL), Marion Toole (TX) and possibly others whose names are lost. During the 1940’s, fish and game directors of the Southeastern Game, Fish and Conservation Commissioners (SEGFC) met annually to discuss federal regulations, legislation and other mutual problems. Each state had a fisheries sub-unit with one or more members of AFS, many of whom accompanied their directors to provide technical advice on policy and other matters. It seemed logical to expand the directors’ meeting to include a meeting of fishery workers. When approached, the directors enthusiastically endorsed the concept and authorized participation by their personnel. Organization proceeded rapidly. 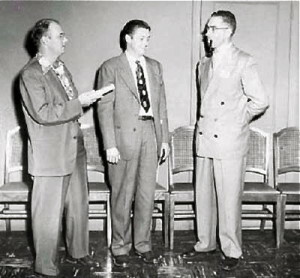 The first conference was held at the SEGFC meeting in St. Petersburg, FL in November 1947. The Southeastern Section of The Wildlife Society (SSTWS) joined the movement and held joint and concurrent programs. The resulting “marriage” of the technical sessions of fish and game professionals with the SEGFC was established then and has continued to date. Without the wholehearted encouragement of the directors, the evolution of both SDAFS and SSTWS would have been delayed or seriously handicapped. Subsequent meetings were held in Lexington, KY (Nov. ’48), Nags Head, NC (Oct. ’49), Richmond, VA (Oct. ’50), and Biloxi, MS (Oct. ’51). At the Biloxi meeting, the attendees elected officers and instructed them to proceed with the formation of a Southern Division. The geographical region encompassed the eleven states of the SEGFC (AL, AR, FL, GA, KY, LA, MS, NC, SC, TN & VA) plus OK, TX and the West Indian islands. The necessary petition was submitted to the parent society and accepted at its annual meeting in Dallas, TX in September 1952. Maryland, West Virginia and Washington, DC joined in later years. The first official session of the SDAFS followed in October 1952 at Savannah, GA. Forty-some fishery workers representing all states in the Southern Division, academia, USFWS and other federal agencies were registered. Officers were elected, five committees were appointed, resolutions were passed and the mechanics of official operation began. A policy of encouraging more effective presentations and discouraging the reading of formal papers was adopted by resolution; it set the tone for many successive meetings. Early programs featured informal presentations, open discussions, and field demonstrations of projects in progress by the host state. Unfortunately, numerical growth in attendance has made the logistics of those arrangements difficult if not impossible to replicate. The camaraderie and one-on-one exchanges of information they permitted are sorely missed. Activation of the Dingell-Johnson Act in July 1951 increased attendance as fishery staffs grew. Registered attendance was recorded as 107 in 1960 and 161 in 1970 (subsequent minutes do not always reflect attendance numbers). Other evidence of expanded activity may be seen in the number of standing committees: 10 in 1960, 14 in 1970, and 19 in 1980. By 1992, there were 23 standing committees listing a total of 345 members! To one who has been involved since its inception, the Division’s major strength has been and remains the intensely motivated professionals who have comprised its membership. I have watched with amazement, delight and immeasurable satisfaction the progress of young workers from neophytes to highly competent fishery scientists and managers. A repetitive scenario has been that of the young scientist nervously presenting his first paper before an audience of mostly older peers. Within a short time, he (or she) is named to a committee; later he becomes a chairman. A few more years pass and he is nominated for office. Many nominating committees have had a difficult job in selecting an election slate–the supply of capable candidates was too abundant! It would be impossible to recognize the hundreds of individuals who have contributed to the progress and success of the SDAFS over the years. The Division has already singled out a number of them with its Outstanding Achievement Award, but there are many unsung troops whose contributions equalled or surpassed many of those named. Due to space limitations and to avoid overlooking any deserving individuals, I shall not attempt to list them here. An expanded history is planned which will recognize additional workers and activities of the SDAFS. FOR A COMPLETE LISTING OF PAST PRESIDENTS OF SDAFS, click here. Fifty years after its formation on 20 October 1952, the Southern Division of the American Fisheries Society celebrated its Golden Anniversary in 2002 at the Division’s Spring Meeting in Little Rock, Arkansas. Download “A 50-year History of the Southern Division of the American Fisheries Society” by Mike S. Allen, et al.